"You can't shoot me! I have a very low threshold of death. My doctor says I can't have bullets enter my body at any time." As with the modern day Scream movies and their Scary Movie spoof counterparts, no sooner had the Bond franchise established itself than up popped a crop of parodies. The Flint films were first, but Casino Royale is by far the most elaborate. David Niven plays Bond, and he's backed by a massive cast filled with some of the era's most well-known character actors. Truthfully, what's onscreen isn't all that impressive. The cumbersome spoof runs well over two hours and is basically a string of separate sketches with little coherent plot to tie them together. The emphasis is on "mod" happenings and bright colors. Jokes fall by the wayside in favor of elaborate production design and gratuitous cameos. There are certainly worthwhile elements. The plot, such as it is, follows the antics of bumbling MI5 agents who, in an attempt to thwart an assassination attempt on James, have all adopted the 007 code number. A connection is suspected between the evil Russian organization SMERSH and gambler and malevolent villain Le Chiffre (Orson Welles), and slick gambler Evelyn Tremble (Peter Sellers) is brought in to do a little spying. Of course, none of this really matters, since about five percent of the running time is actually spent on developing a coherent story. Elaborate side plots and nonsensical humor is the order of the day, and truthfully, the saving grace. Despite the stunt casting (and a smooth secret agent turn from Niven), the plot thread is easily the film's weakest element. I much preferred the sketches and running gags. Great moments include a scene set at spy school, some broad theatricality from Welles, and a typically brilliant bit of physical comedy from Woody Allen (who doesn't get enough credit for said, methinks). Overall, there are as many segments that don't work as do, but the elaborate production design gives you something to look at even during the spotty bits (i.e. anytime Andress and Sellers are together). It seems the real entertainment was going on behind-the-scenes. With a script that was retooled by as many as ten writers (including such luminaries as Billy Wilder and Allen) and no less than five directors (John Huston, Ken Hughes, Val Guest, Robert Parrish, and Joe McGrath) producing unrelated segments, it's a wonder that the film was able to be edited together at all. The stories from the set are legendary. It's said that Peter Sellers and Orson Welles loathed each other, and refused to film their scenes together, necessitating the use of frequent cutaways (though there is at least one shot in which they do appear together). Sellers wasn't popular with the producers either, creating problems on-set with his prima donna attitude. When he decided to take an unannounced day off, he was asked not to come back, and the end of the film was rewritten to account for his absence. Casino Royale is definitely a product of the era in which it was made. The obscure humor and mod sensibilities will likely be lost on younger audiences. These days, the film is probably most influential for the continued success of singer Burt Bacharach—his enduring The Look of Love was itself spoofed in the Austin Powers films. Despite all of its faults, Casino Royale is worth revisiting, if only as a historical oddity. I think it's safe to say that no one will remember Not Another Teen Movie in 35 years. Image Transfer Review: Though it didn't receive a full restoration, MGM has done a nice job glitzing up Casino Royale for its DVD debut. The colors look nice and bright, though not quite as eye-popping as the colorful films these days. Black level is pretty solid, and shadow detail is decent. There's a lot of detail onscreen that comes across nicely, though I did spot some occasional artifacting in places. For a 35-year-old, there's very little visible wear on the source materials. Audio Transfer Review: MGM has also pumped up the original mono track with a 5.1 DD remix (though the original mono track is included for purists). The real benefit of the remix is to the music, which is nicely spread across the front soundstage and into the surrounds, and which is leveled differently within the film as well, balancing it better with other elements in the mix. The dialogue is also a little clearer, anchored nicely in the center channel. Mind you, a remixed mono track will never sound as good as a modern mix, but this is a very nice effort. Extras Review: Casino Royale has a small but vocal cult following, and for years DVD fans on the Internet were clamoring for its release. Many thought it would never come due to legal snags related to the film's status as a Bond picture. Happily, they were wrong. Better still, MGM was the studio to get the rights. And though it isn't billed as a special edition, the included extras are much more than I was expecting. First is a very, very appreciated inclusion, and the type of thing DVD extras were invented to include. In 1954, TV's Climax Theater produced a live, made-for-television adaptation of Fleming's novel, starring American Barry Nelson as 007. The black-and-white production, which was first broadcast live, is a pretty dull affair, despite some decent production design and fairly good camerawork. Thank goodness United Artists realized that the only real Bond is a British Bond. Oddly enough, an Australian, Michael Pate, fills the Felix Leiter role. Look for Peter Lorre as Le Chiffre. The program, which runs about an hour, is more of a curiosity than anything else, which makes it a perfect inclusion on the bonus features page. There's also a glossy, informative 20-minute making-of hosted by Val Guest, who takes us through the troubled and tumultuous production of the picture. He talks about on-set feuds, general confusion among the actors, and a total lack of cooperation between the directors. Guest is too polite to badmouth his contemporaries, but he does serve up plenty of juicy gossip. Rounding out the disc is a quirky theatrical trailer. Note that the 007 nickname appears nowhere on the disc or packaging. Fleming is mentioned in the credits on the back (his book "inspired" the film) in a tiny, near-illegible font. 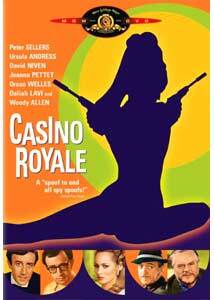 An overblown, overlong, unwieldy spoof, Casino Royale is more a historical oddity than a successful farce. It plays like a sketch comedy show, and like latter era SNL, more bits fail than not, but the cast is worth watching and the Burt Bacharach score is definitely worth hearing. Kudos to MGM for treating another bit of cult entertainment with the respect its fans deserve.